One of the great stories of this year’s Pulitzer Prize winners is that of the Bristol Herald Courier from Bristol, Virginia, which won the coveted prize for public service journalism, beating some of journalism’s giants. The paper’s reporter, Daniel Gilbert, (pictured in the middle of the photo holding the portfolio) spent 13 months investigating local natural gas rights and compensation for landowners, impressing the judges. 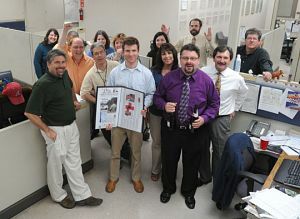 The Washington Post, which itself bagged a few Pulitzers,covered the story of the Courier‘s win, as did other media. But the Courier’s editor, J. Todd Foster, apparently didn’t like the Post’s story, which seemed to reopen a decades-old wound he’d been harboring since being rejected for a job at the Post years ago. So Foster fired off this pithy editorial attacking the quality of the reporting by the Post’s reporter, Ian Shapira, just stopping short of calling him an entitled brat because he went to Princeton and did manage to get a job at the Post. As my husband, who showed me this piece, pointed out, the best part of Foster’s article is in the comments section, where a reader has sought to prove Foster’s charge of elitism by sending in a small real estate item which notes that Shapira and his wife bought a house for over a million dollars. Foster’s diatribe is entertaining. But the Post’s piece is basically admiring of what the Courier achieved, proving that often the hardest stories for journalists to write are those about other journalists. Could Gawker Be Sued for Paying for iPhone Prototype? Jeff Bercovici from Daily Finance.com thinks so. According to Bercovici’s story, Gawker Media, which runs the gadget site, Gizmodo.com, admitted to paying $5,000 to get its hands on the new fourth generation iPhone. The seller apparently told Gizmodo he found the phone in a bar in Redwood City, California. Gizmodo forked over the cash and got themselves a worldwide scoop. They say they were planning to give the phone back all along. Paying for stories has always been bad journalism. Encouraging people to behave badly just to get a scoop, is also bad journalism. Update: Now the case looks like it has become a criminal one LINK. The Washington Post was a big winner in this year’s Pulitzer Prizes.